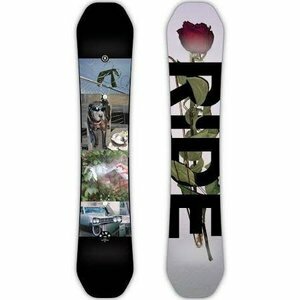 The Ride Kink Snowboard is a soft-flexing jib twin that's overbuilt to put up with the inherent abuses of freestyle snowboarding. Cleave Edge™ Steel edges are made from 50% thicker steel to take the abuse of hitting rails, riding down stairs, bonking things not covered in snow, and all of the other fun things that ruin a snowboard. Roll-In Slimewalls® are urethane sidewalls designed to damp high speed vibration, but more importantly on the Kink, add durability to resist blown edges when hitting rails or tomahawking down the stairs. This board is designed for a rider looking for a soft-flexing twin that is overbuilt to put up with the abuse of freestyle snowboarding. Rocker type: Twin Hybrid Camber – A true twin shape hybrid profile that has more camber than rocker. Shape: Quadratic Sidecut – Blending of three radii to improve turn initiation/exit while providing the best grip possible. This design is uniquely formulated for each model based on its shape and riding style. Core: Performance™ Core – High strength Aspen is combined with Bamboo and lightweight Paulownia wood to provide the perfect balance of strong and light. Laminates: Biaxial Glass – 90° and 0° angles, fun and forgiving. Double Impact Plates – Added underneath each binding area to improve compressive strength and prevent board breaks where it matters most.